all 3 kids were in such a good mood….the girls were because they were excited to be on vacation…and Nolan was just happy to be with us. Looking at them all sitting and playing and giggling on the pull-out couch just made my heart full. Geoff fixed us all a breakfast of pancakes and bacon….then we all got dressed and ready and headed to Moody Garden's Palm Beach. We had a pretty good time. 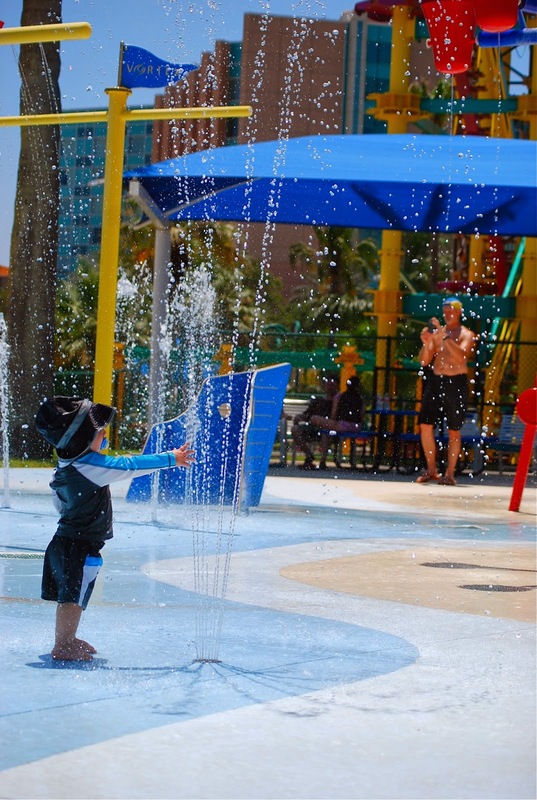 There was a wave pool that Parker and Payton loved….and a lazy river….and couple of big slides…and a spray ground. 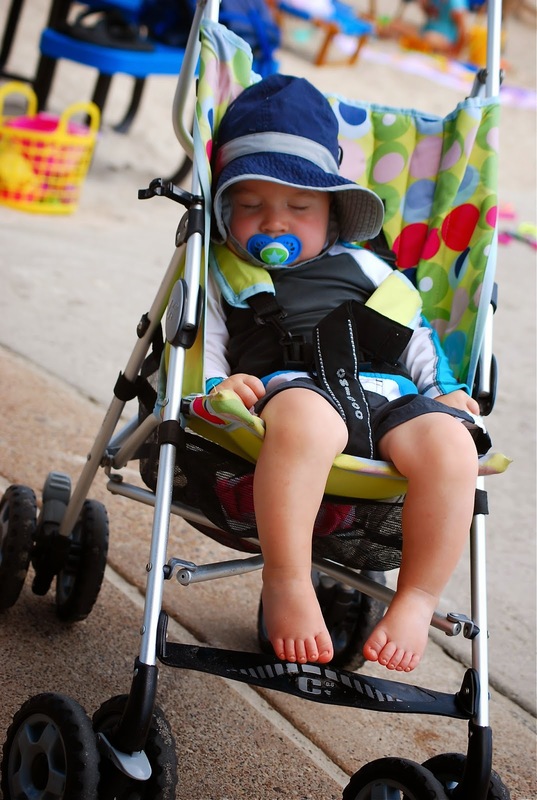 Nolan missed his morning nap so I eventually pushed him around until he fell asleep. We got there around 10am and I think left between 2 and 3pm, I think. Grace was a little more timid and needed someone to go down with her at first. After Grace and I went down the slide one time together…she suddenly got brave and wanted to go down by herself. 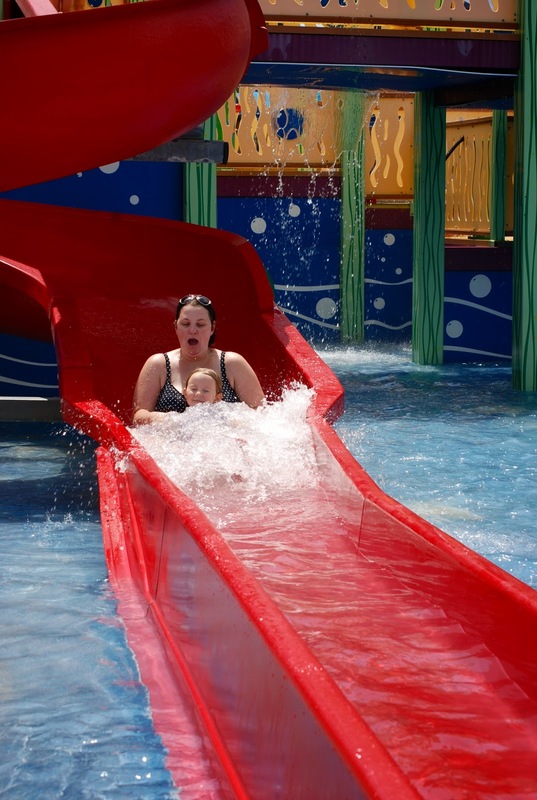 And on her very first time by herself…..this happened…. And dumped right on her just as she was at the bottom. She was NOT happy! My niece, Paisley taking her nap, too. Parker and Payton decided to stand under that water tower. And these pictures make me laugh. Once Nolan woke up…we headed back to our little picnic table and ate lunch. We eventually made it over to the spray grounds. And Nolan seemed to enjoy this. After we left…we came home and settled the kids in for a little afternoon nap. 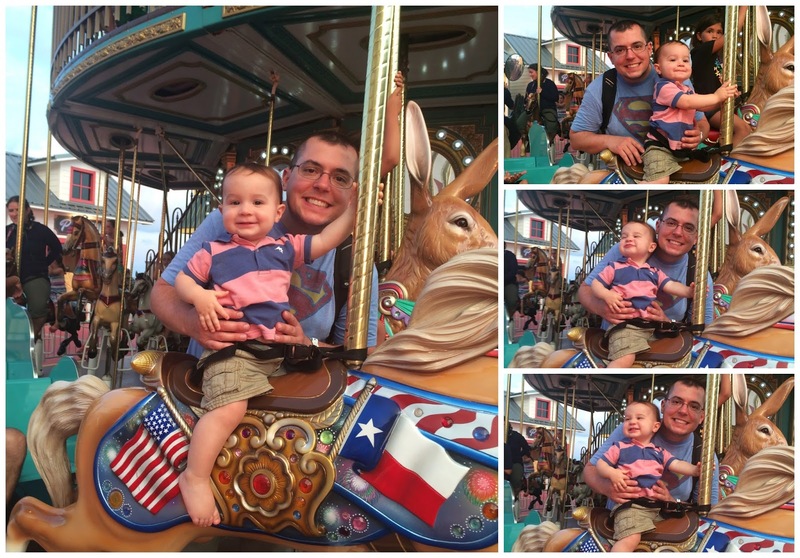 We got cleaned up and dressed and headed out to Pleasure Pier for dinner and let the girls ride few rides. We ended up eating dinner at Bubba Gump's Shrimp Co and were a little disappointed with the food. We should have known better! But they had us seated quickly and the service was pretty good so we didn't have to way too long for anything. The girls flattened a penny each. 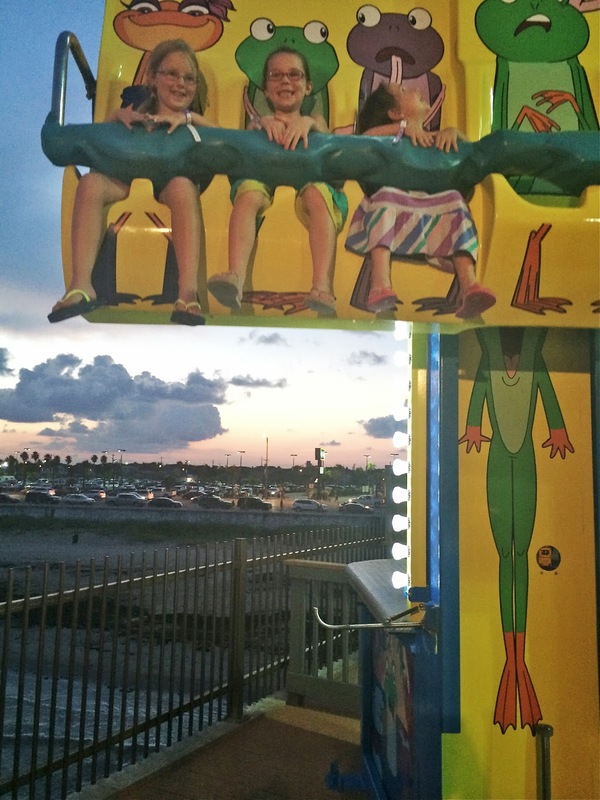 After dinner….we headed into Pleasure Pier to let the girls ride a few rides. 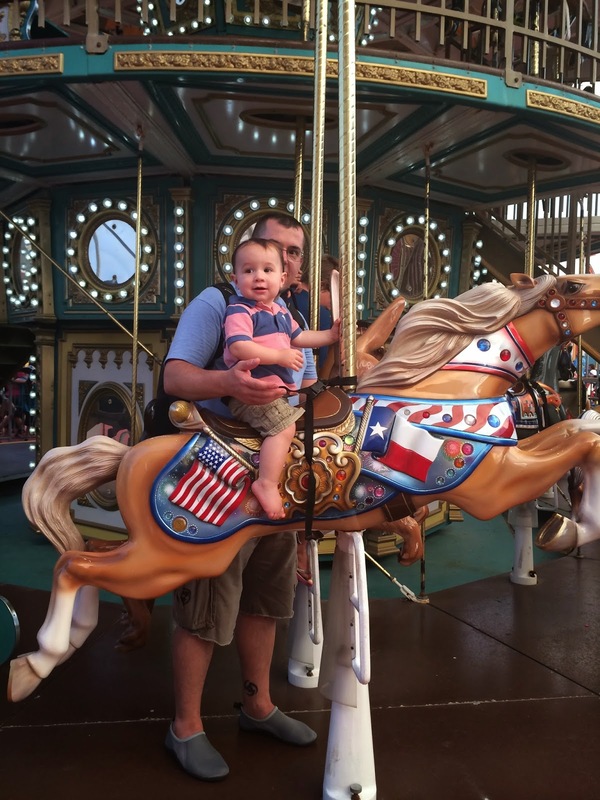 Sweet Boy was so excited to ride! This is the first double decker carousel I've seen, I think. 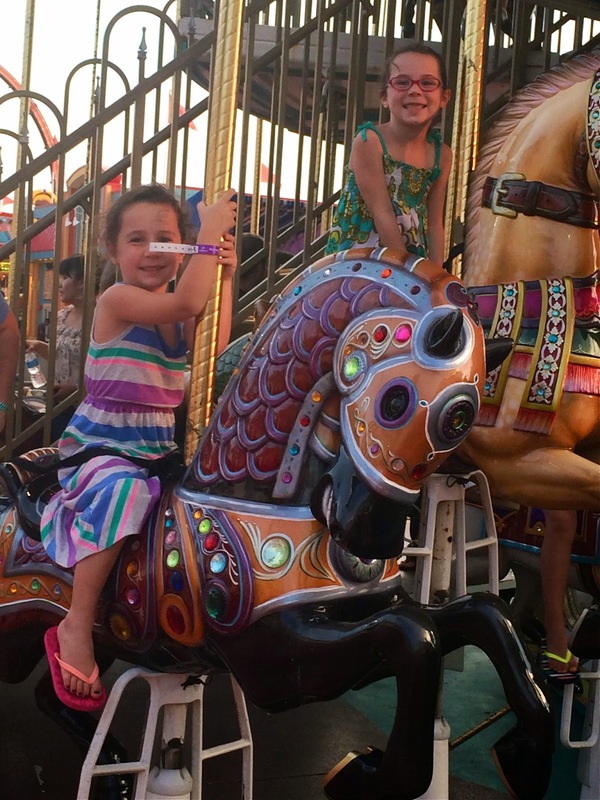 This ride was the girls' favorite. 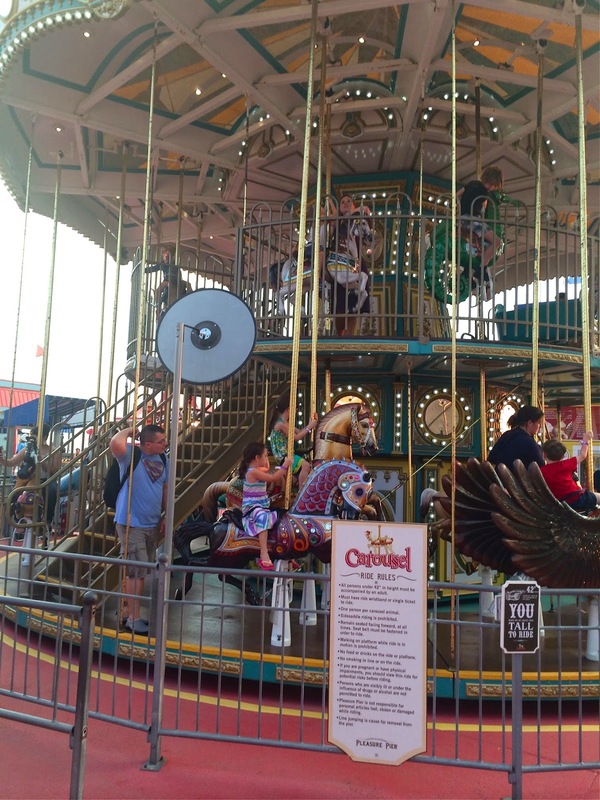 And since there were hardly any kids in the line…I think they rode this maybe 4 or 5 times. And the tea cup ride. And this guy working the ride hopped right in for the picture. All of us. My brother, Brian (on the left) joined our Family Vacation earlier in the afternoon. Looks like fun was being had by all! Sure makes me want to go to the Beach!